I have two columns in a Google sheet: an ID column with a single value per cell and Color column with an arbitrary number of comma separated values per cell. 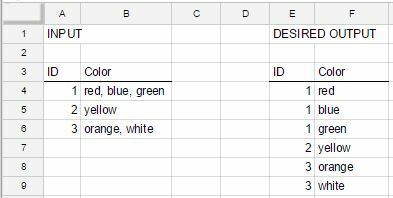 I'd like to expand the Color column so each value is in its own cell, while retaining their associated IDs. This is illustrated in the attached image, and in this worksheet. Replace 1000 by 30000 or a larger number. The 1000 is the headers argument of QUERY(data,query,[headers]). We want use a number big enough to include all the rows of the source data. If the second column of the source data has rows with more than 6 items, replace the 6 in OFFSET(A1,,,1,6) by the corresponding number of items. See the reference for further details. How to extract the Account's Name according with the total of members?